Hyperthinking is predicated on the assumption that the single most important skill required to help you and your organization thrive in the age of perpetual change, digital communications and networks is the mind-set of individuals. This includes your values, your ability to learn and ability to adapt to change. After 14 years of experience with leading global companies, author Philip Weiss has developed an approach that pulls together the ingredients needed for the modern executive to both adapt and thrive in this new age. 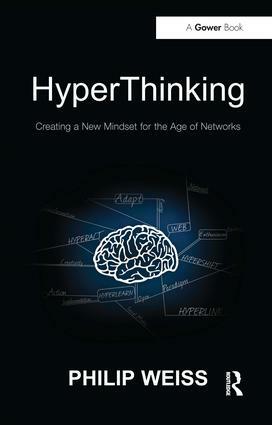 The Hyperthinking model has been developed and tested on teams, clients and the author’s networks with great success. The book explains how Hyperthinking can apply to different facets of our lives, starting from our personal experience and our role in society and shows how to adapt better to the new business world. Hyperthinking is a set of values and tools that, used in combination, enable individuals to embrace change develop their creativity and effectively engage in the digital age. It has been tested by a variety of business executives and helped them to understand change, as well as overcome fear or resistance to technology. Philip Weiss offers the perfect antidote to information overload; a wonderful blueprint for personal and organizational innovation; and a set of perspectives to help us all make sense of a fast-changing business environment. Read it and start Hyperthinking! Contents: Hyperthinking: executive summary; Part 1 The Beginning of the End of Business as Usual: Flying high; Risks or opportunities? ; Meet Paul. Part 2 Defining a New Language: Shifting your perspective; A new word…a new concept. Part 3 The Four Dimensions of Hyperthinking: Hypershifting; Hyperlearning; Hyperlinking; Hyperacting; Collaboration. Part 4 Becoming a Hyperthinker: Embarking on the journey; (Almost) the final word. Part 5 Stories of Hyperthinking: Meet the real hyperthinkers; Catching up with Paul; Index. Whilst studying Philosophy, Politics and Economics at Oxford, Philip Weiss launched two college magazines, started the first student radio station on a full FM licence in the UK, and received the Young Achievers Award from HM the Queen. In Brussels he set up ZN a leading eCommunications agency working with companies, political institutions like the European Commission and Parliament and organisations on how to use the Internet to integrate and transform communication. He works with such household names as Toyota, Microsoft, Sony, Sanofi Pasteur, UCB and various industry associations. His Hyperthinking model was developed to enable the ZN team and their clients manage rapid change and innovation to adapt their strategies and structures to the age of networks. In 2009, Philip helped co-found TEDxBrussels. He is now Chairman of IABC Europe (International Association of Business Communicators).